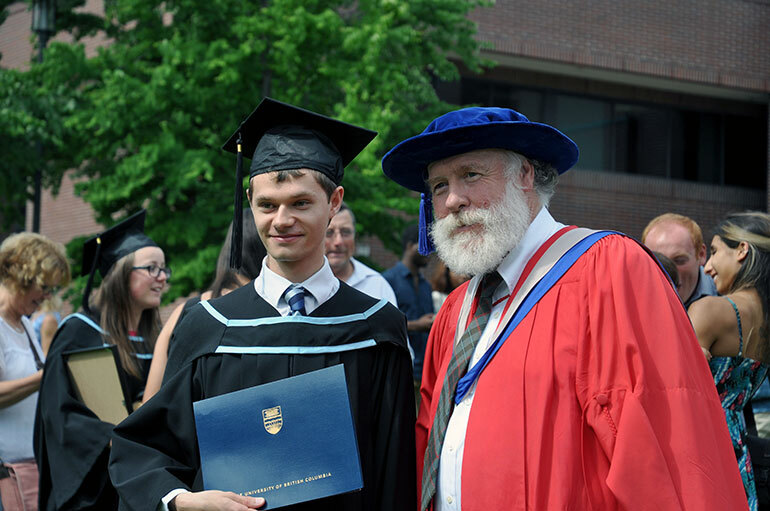 UBC student Raphael Nowak (left) poses with his mentor Ian Walker, professor of biology. While studying Earth and Environmental Sciences (Freshwater Science), Nowak is also a tireless volunteer at Kelowna General Hospital and with the Central Okanagan Search and Rescue. He’s accumulated a lengthy list of qualifications and accomplishments, and remains on call to take part in lifesaving operations around Lake Okanagan—all while managing to stay on the Dean’s list for three straight years. Serving the community is a big part of Nowak’s drive, and that work, along with his stellar academic record, is a key reason why he is the recipient of the largest undergraduate award given to a UBC Okanagan student. Nowak has maintained a perfect attendance record in class, despite spending thousands of hours volunteering. With such an impressive list of accomplishments, it is easy to see why James Paterson, managing partner at Pushor Mitchell LLP, says the firm is proud to support Nowak through the award. Nowak also acknowledges the impact being a student at UBC Okanagan has had on him. It’s not just about the knowledge he has gained, but the skills he has developed to be able to think critically and analytically, whether in a chemistry class or a search and rescue situation. And he’s thankful of the strong support he’s received from his professors, most notably from Bernard Bauer, Jeff Curtis and Ian Walker. Nowak plans to stay busy following convocation. He’s writing a book on Okanagan Lake, drawing on years of personal research and investigations. He also aims to apply for UBC’s Southern Medical Program, saying the Pushor Mitchell prize will help him stay committed to his education and extracurricular involvement.